Subaru is turning heads with the all-new Forester. This popular compact SUV has been completely redesigned. The 2019 model marks the start of the fifth generation and a brand-era for the line. 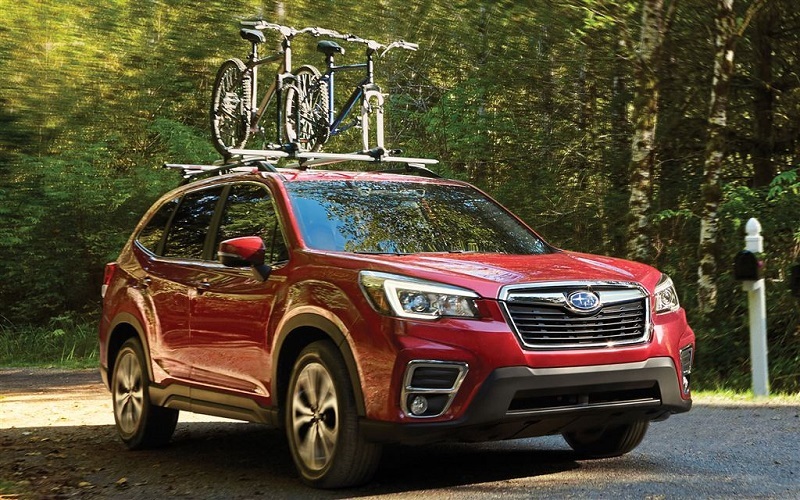 2019 Subaru Forester is designed to cater to what modern drivers want most. It has a spacious interior that offers plenty of room to roam. Furthermore, high-tech entertainment features and safety systems are plentiful. Why lease a new Forester? Subaru has managed to pack this affordably priced vehicle with all the features you would ever need. Check out the lease specials at Flatirons Subaru today. Our team is excited to show you what this crossover can do. The new Forester has a sleek and sporty look. Sloping curves and sculpted lines work together to make the vehicle more aerodynamic. Some of the most notable design features can be found on the front-end. The Forester has an aggressive front bumper complete with a large grille and chrome-trimmed light cutouts. The headlights utilize LED technology to make them stand out. LED signal lights surround the bulbs to create a distinct look. The Forester is available with responsive headlights that are connected to your steering. The beam will move around a corner as you turn to improve visibility. On the back, you'll find the large liftgate. Subaru has widened the liftgate door to improve cargo access. Some additional features of the Forester include the available raised roof rails with integrated tie-downs, the standard 18-inch wheels, and optional panoramic sunroof. We invite you to stop by our dealership today. You can check out the lease specials at Flatirons Subaru. The inside of the Forester is beautifully designed for convenience and comfort. Soft-touch materials are used throughout. The front seats have a bucket-style design for added comfort. 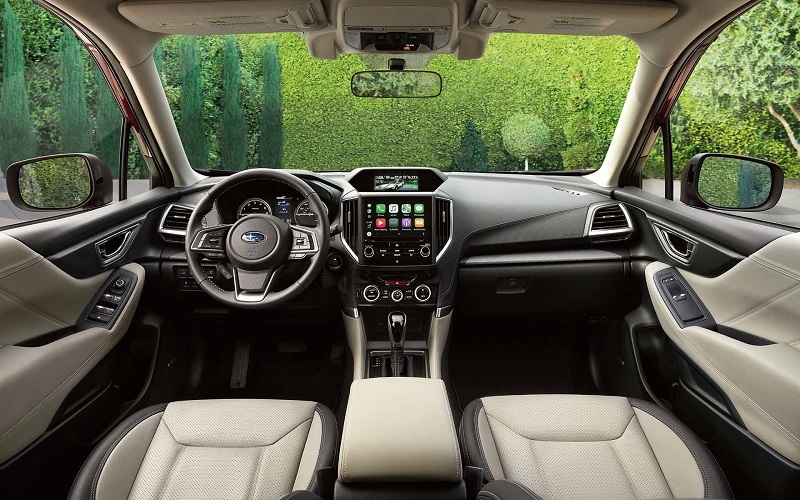 Subaru offers a range of interior trim options to suit anyone's style. Some of the options include gray cloth, black leather, and saddle brown leather. Accent stitching is used to give the seats a modern flair. When it comes to space, the new Forester doesn't disappoint. Every 2019 Subaru Forester near Denver has 111.9 cubic feet of passenger space. In the rear cargo area, there are 76.1 cubic feet of room. The rear seats also fold down if you need to make some extra space for large items. Subaru also added a lot of technology to the new Forester. The available 8-inch touch screen allows you to stay connected wherever you go. You can connect a compatible smartphone device to make hands-free calls, stream music, and get navigational directions. Stop by our showroom today to get a closer look at the Forester's cabin. We're serving Denver Longmont Boulder drivers. This new iteration of the Forester is built on the new Subaru Global Platform. The body of the crossover is made of high-strength steel. This material is incredibly durable and can keep you safe during your drive. Furthermore, the toughness of steel provides a few additional benefits. It makes the body very rigid. This results in improved handling around tight curves. It also helps to reduce vibrations and road noise so that you can drive in peace. Rough paths are also no match for the Forester. This crossover is available with all-wheel drive and X-Mode. X-mode allows you to switch between different driving modes based on your surroundings. Each setting has adjusted torque, throttle, and suspension settings. With the standard 8.7-inches of ground clearance, you won't have a problem dominating any path you take. Every 2019 Subaru Forester near Denver is powered by a 2.5-liter Boxer engine. It's a four-cylinder engine that's capable of producing up to 182 horsepower and 176 pound-foot of torque. Advanced technologies, like direct injection and an active valve control system, are included to maximize performance. It has plenty of power to give you a dynamic driving experience. The engine is paired with a unique Lineartronic continuously variable transmission system. The transmission is smooth and easy to use. Every Forester is also equipped with SI-Drive. This system allows you to select between Intelligent and Sport driving modes. The modes have different throttle response settings that can change the way you drive. Why lease the new Subaru Forester? Visit our showroom today to find out. Subaru has taken safety very seriously with the new Forester. Every single model comes with Eyesight Driver Assist technology. This package utilizes advanced cameras and sensors to monitor your surroundings. You're able to see two of the cameras from the front-end. They're installed inside the cabin and face out to look at the road ahead. Pre-Collision Assist, Adaptive Cruise Control, Lane Departure Warning, and more are all part of this package. These systems also work with the DriverFocus Distraction Mitigation System inside. A separate digital display provides you with important safety information as you drive. 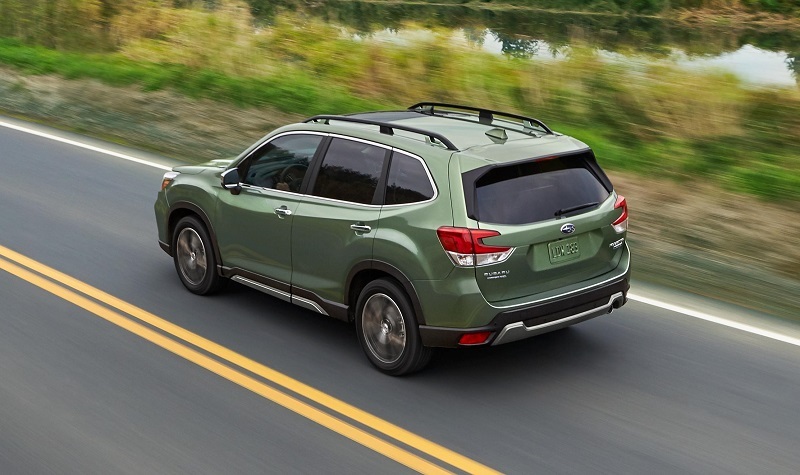 Some additional features you can get on your new Forester include Blind Spot Monitoring, Rear Cross-Traffic Alerts, and more. The new 2019 Subaru Forester is ready to rock American roads. It's filled with innovative technology that can help you stay safe no matter where you go. With its stunning exterior design and intuitive entertainment systems inside, you're to enjoy the ride. If you're interested in getting a new Forester, you check out the lease specials at Flatirons Subaru. Our team is proud to be serving Denver Longmont Boulder drivers. We're committed to meeting all of your automotive needs. Swing by today to learn more about your options and to take the Forester out for a test drive.